The Home of Quality Antiques and Collectibles. EliteRepeats welcomes our Japanese friends from the bottom of our heart. We have been to Japan and we have welcomed Japanese buyers to our home in the United States (USA). We are pleased that we can do business with you. Eight (8) Vintage Noritake Art Deco Demitasse Cups and Saucers "Red M in Wreath". 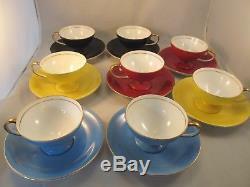 Description : What a great set of 8 Art Deco Noritake Footed Demitasse Cups and Saucers in 4 different bright colors; blue, yellow, red and black. It's not often you see these pretty Noritake cups and saucers, each cup footed and gold trim on both the cup and saucer and all in terrific condition. 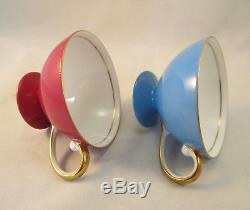 Size: The saucers are 4 3/4 inches across and the cup, sitting on the saucer is 2 inches tall. Condition : Outstanding; my pictures are an accurate representation of this piece, so please take a close look. There are no chips, cracks, hairlines, or repairs. Mark/Backstamp : Authentic Noritake Mark, Red "M in Wreath". 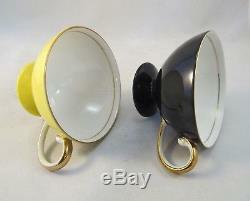 The actual mark is seen in the last picture and is on both the cup and the saucer. Check out our great Positive Feedbacks, now more than 3,135. 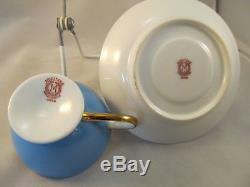 We are members of the International Nippon Collectors Club and the Noritake Collectors' Society. Consistently receives highest buyers' ratings. Has earned a track record of excellent service. 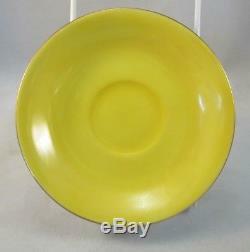 We only sell authentic and genuine Nippon (Old Noritake) and Noritake (Art Deco) - never reproductions. Powered by SixBit's eCommerce Solution. The item "Eight (8) Vintage Noritake Art Deco Demitasse Cups and Saucers Red M in Wreath" is in sale since Sunday, November 23, 2014. This item is in the category "Pottery & Glass\Pottery & China\China & Dinnerware\Noritake". The seller is "eliterepeats" and is located in Norfolk, Virginia. This item can be shipped to United States, Canada, United Kingdom, Japan, Australia, Denmark, Romania, Slovakia, Bulgaria, Czech republic, Finland, Hungary, Latvia, Lithuania, Malta, Estonia, Greece, Portugal, Cyprus, Slovenia, China, Sweden, South Korea, Indonesia, Taiwan, South africa, Thailand, Belgium, France, Hong Kong, Ireland, Netherlands, Poland, Spain, Italy, Germany, Austria, Israel, Mexico, New Zealand, Philippines, Singapore, Switzerland, Norway, Saudi arabia, Ukraine, United arab emirates, Qatar, Kuwait, Bahrain, Croatia, Malaysia, Brazil, Chile, Colombia, Costa rica, Dominican republic, Panama, Trinidad and tobago, Guatemala, El salvador, Honduras, Jamaica, Antigua and barbuda, Aruba, Belize, Dominica, Grenada, Saint kitts and nevis, Saint lucia, Montserrat, Turks and caicos islands, Barbados, Bangladesh, Bermuda, Brunei darussalam, Bolivia, Ecuador, Egypt, French guiana, Guernsey, Gibraltar, Guadeloupe, Iceland, Jersey, Jordan, Cambodia, Cayman islands, Liechtenstein, Sri lanka, Luxembourg, Monaco, Macao, Martinique, Maldives, Nicaragua, Oman, Peru, Pakistan, Paraguay, Reunion, Bahamas, Viet nam.